Only one thing could make the first face-to-face meeting between bloggers (Can Opener Boy & Joyful Quarles) better: Dessert at La Capitale! On Tuesday 10th August at 8pm the two wonderments converged, and a great time was had by all. I'm a cobbler man usually, and (deep breath for a true confession) chocolate is just, well, "OK" for me. I have to admit that my palate is just not that refined with some things. Coffee is one of them. We all had a cup of decaf. I thought it was alright, but my wife and JQ both said it tasted "old". The server was gracious and offered to make a fresh pot after whisking away our old cups. A few minutes later with 3 fresh cups in front of us we sampled again and 2/3 of us pronounced the fresh decaf much better. 1/3 of us (ahem, me.) said "Well, it is hotter, but aside from that, it's alright". If it was beer, or bread, or cheese, it would have been a much different story. But coffee, and chocolate? Not so much. 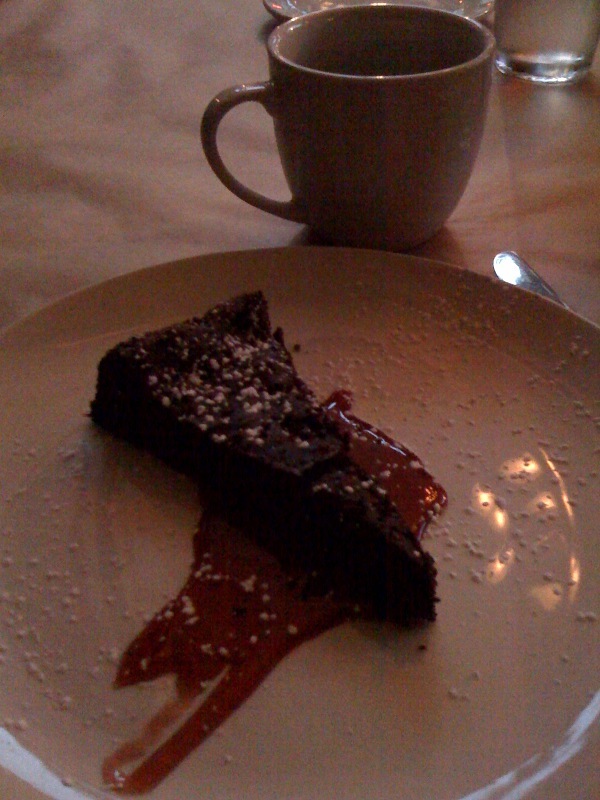 So to stretch myself I got adventurous with the Flourless Chocolate Cake with Raspberry Sauce. I am a raspberry sauce fan and figured even if the flourless cake was just OK to me, the raspberry sauce would make up for it. Therefore I was pleasantly surprised when the cake was not overly dense and rich, and the chocolate was actually quite flavorful. Not too bittersweet, but just intense enough to make me keep wanting more. But I have to say the sauce was the star. Often a raspberry sauce is overly thin, making it hard it really taste enough in each bite. Or if it is thicker it is because it is syrupy and overly sweet. This sauce was somehow thicker and more robust without being cloyingly sweet. Perhaps it was a reduction, I'm not sure. All I know is that it stuck to my fork and allowed me to have a bit of warm raspberry goo with each bit of wonderful chocolate flourless goodness! 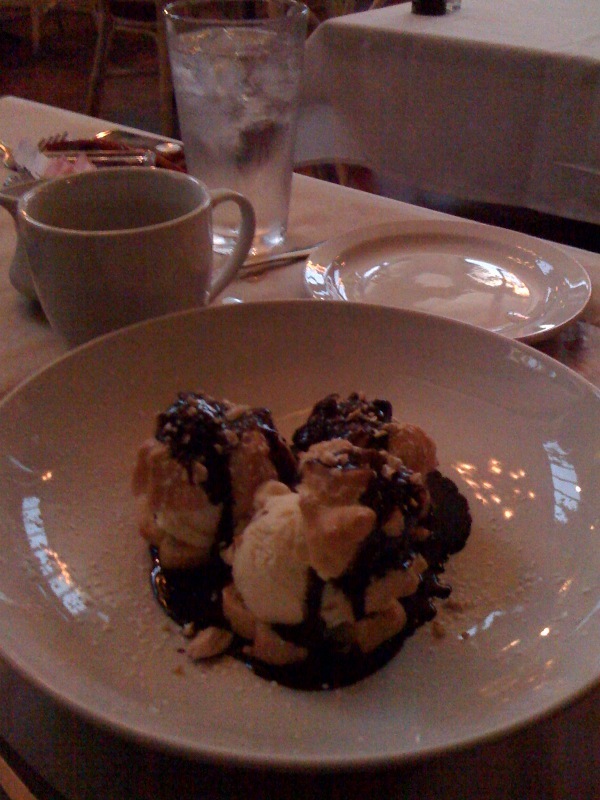 My wife had the Profiteroles. We had no idea what it was and when she heard there was ice cream and chocolate sauce involved she was sold. Three little puff pastries filled with rich ice cream, drizzled with chocolate, atop a small lake of the same yummy chocolate. She said they were sweet and each bite had a good amount of ice cream and pastry. The chocolate sauce really brought the dish together, and the dusting of powdered sugar was a nice touch. JQ had just come from a photoshoot and needed a bit more sustenance. 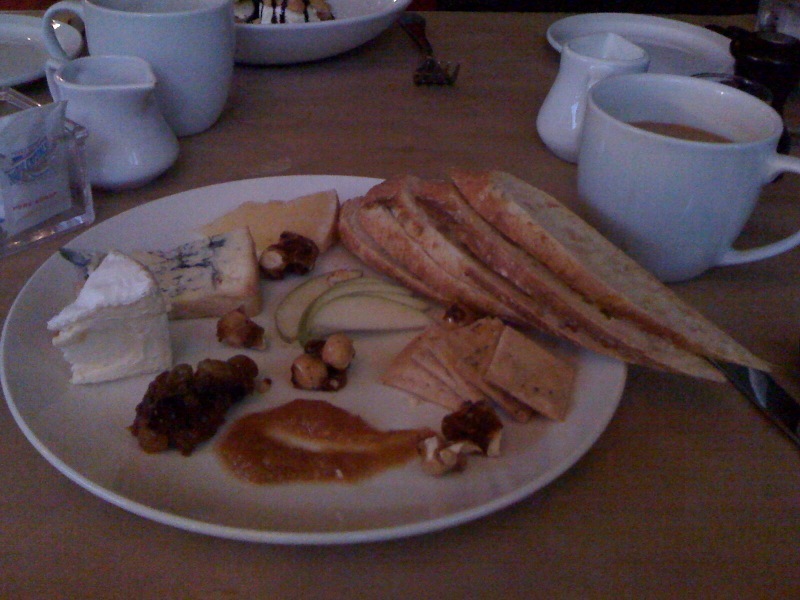 She ordered the assorted cheeses plate and proudly announced herself to be a cheese-o-holic. I offered that I too was a lover of all things cheesy and we almost had to arm wrestle over who loved cheese more. As I had already ordered, we let it go, but I'm sure there is a re-match in the offing. While presentation was nicely done in the other two, the plating of this was the most captivating. Seen here are Plum Brandy Cabecou (France), Trailhead Tomme (Pt. Townsend, WA) and Fourme d' Ambert (France) -- with Gala apples and candied hazelnuts. We all enjoyed ourselves so much we ended up closing the place, and deciding we'd have to do it again real soon, perhaps with a larger group!